(6512, John E. Shanafelt Collection, OHS). (20282.76.12.3, Cherokee Strip Regional Heritage Center Collection, OHS). 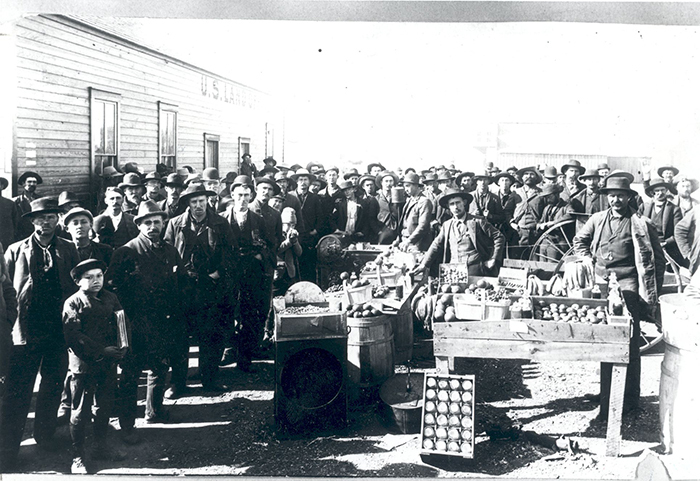 The September 16, 1893, Cherokee Outlet Opening was Oklahoma's fourth and largest land run. Economic pressures plus poor planning and inadequate enforcement by federal agencies made it even more chaotic than earlier runs, resulting in massive fraud, widespread suffering, and a number of deaths. The Outlet was one of three areas the Cherokees had acquired upon removal to lands in present eastern Oklahoma under the Treaty of New Echota. Besides the Outlet, which contained about seven million acres directly west of their lands, the tribe also claimed the Neutral Lands in southeastern Kansas plus the area properly known as the Cherokee Strip along the southern border of Kansas. The Cherokees lost the Neutral Lands and the original Cherokee Strip with the 1866 Reconstruction Treaties. At the same time, the United States declared the eastern third of the Outlet surplus and began moving a number of smaller tribes there. Railroads, cattlemen, and home seekers then began efforts to acquire the remainder for their purposes. 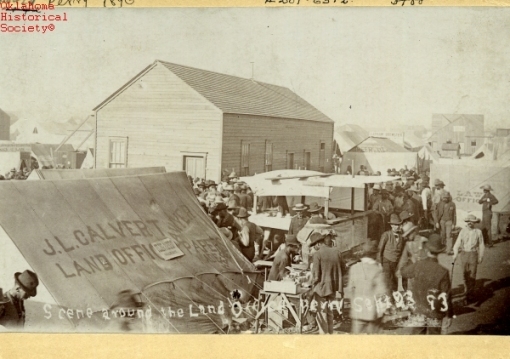 Completion of railroads through the Outlet encouraged cattlemen to use the land, even as the railroads began supporting boomer groups such as David L. Payne's Oklahoma Colony. In June 1884 Payne led more than fifteen hundred settlers to Rock Falls and other locations in this region, now called the Cherokee Strip. The Cherokees protested vigorously, and the army removed the boomers in early August. The courts subsequently refused to convict the boomers of criminal charges, but major boomer incursions into the Outlet ceased for eight years. In the meantime, the Cherokees gained a major source of income through lease arrangements with large cattle ranches. In 1889 the Cherokee Strip Livestock Association agreed to pay $200,000 annually for a five-year lease of the Outlet. Congress nullified the arrangement in March 1889 and authorized purchasing the region for $1.25 per acre. The Cherokees protested strongly, as they had earlier rejected the cattlemen's offer of $3.00 per acre, but protests were in vain. In February 1890 Pres. Benjamin Harrison forbade all grazing in the Outlet after October, effectively eliminating tribal profits from leases. Even though the army never managed to remove all ranching from the area, because of manpower shortages and other problems, the Cherokees agreed to sell the following year at a price ranging from $1.40 to $2.50 per acre. While unable to prevent the loss of the Outlet, the Cherokees obtained federal agreement to two provisions that delayed its opening and added to growing tensions. First, the government agreed to remove all intruders from Cherokee lands in eastern Oklahoma, a process that took more than a year. Second, individual Cherokees were permitted to establish claims in the Outlet. Many Cherokees then applied for claims, some of which were linked to speculative efforts to gain control of potential town locations, so charges of a "Strip steal" added to growing unrest among the boomers. Rapid growth of boomer camps mirrored an agricultural crisis in a decade when droughts, sharply declining agricultural prices, and the Panic of 1893 bankrupted many farmers. Clustering in Kansas's boomer camps, multitudes waited, on the verge of starvation, living in tents or makeshift dwellings, anticipating the opening of the last large portion of good land in the public domain. By February agitation reached a fever pitch. Calls for an invasion of the Outlet added to the pressures facing the army, still struggling to remove ranchers, and now trying to contain growing thefts from the ranches. Secretary of the Interior Hoke Smith implemented new procedures he hoped would prevent "sooners." He strengthened law enforcement in southern areas of the Outlet and at townsites, assigning a thousand deputy U.S. marshals, but the army remained almost wholly responsible for the northern border, the largest concentrations of people and sooner activity. Smith then barred any person who had been in the Outlet previously from establishing a claim. Many feared this included those who had worked in or even crossed the region in the past. Such questions spawned numerous legal disputes following the run, but Smith's most important rule led to widespread suffering. He required the establishment of nine registration booths where everyone who sought a claim had to obtain a certificate to show at the land office, if they gained a claim in the run. False registrations, counterfeiting, and the sale of certificates were common, and many sooners thereby obtained bogus certificates. Understaffing of booths created worse complications. Four booths were established in Oklahoma at or near Orlando, Hennessey, Goodwin, and Stillwater, with additional booths in Kansas at Kiowa, Cameron, Caldwell, Hunnewell, and Arkansas City. They did not begin operation until Monday, September 11, and were open only ten hours daily until the day before the run. Tens of thousands gathered at booths, located on the prairie with neither shelter nor immediate access to water or other necessities. Only forty-five clerks staffed the nine locations, so lines often reached a mile long with people four abreast. Many held their places for days without water. Dry weather, choking dust, and smoke from nearby prairie fires afflicted the shuffling crowds. At least ten people died of heat stroke and similar problems. Arkansas City newspapers reported fifty cases of sunstroke in one day; six victims died that night. About 115,000 individuals eventually received certificates, but many people never managed to register; at least twenty thousand still stood in lines the day before the run. Still more suffering and chaos faced the home seekers. Drunkenness, fighting, and worse crimes increased markedly while federal officials delayed answers to two pressing questions until the last week. To restrain enthusiastic crowds, the president's proclamation opening the lands provided for a one-hundred-foot buffer zone around and immediately within the Outlet. Fearing damage to Indian lands, Indian agents and tribal spokesmen opposed applying these rules for entries at the eastern border. In response, authorities issued contradictory instructions that caused widespread confusion. Similarly, regulations for train use by home seekers were not published until September 13. These rules limited passage to certificate holders and mandated loading trains no more than thirty minutes prior to departure. Railroad officials protested that they could not load such vast numbers in the time permitted, nor could they check certificates or control the crowds. The addition of eight troops of cavalry and four infantry units during July and August buttressed law enforcement, but at least half did not arrive until the end of August. Cavalry troops were assigned within four military districts in encampments at or near Chilocco, Bluff Creek, South Wharton, Pond Creek, Hennessey, Alva, Waynoka, and Clear Creek. Infantry units were stationed at land offices at Alva, Woodward, Enid, and Perry. Increased army patrols finally managed to rid the Outlet of cattle but were less successful otherwise. Soldiers and deputies alike were accused of bribery, brutality, drunkenness, and other crimes. Most of the charges probably stemmed from misunderstandings amid general confusion, but soldiers from Troop C had numerous conflicts with civilians and local officials. Troop C was also involved in one of the run's most unfortunate incidents, the killing of John R. Hill. Amid confusion about the location for the run from the Chilocco reservation, the officer in charge permitted some participants to start from a point three miles inside the Outlet, effectively granting those people a head start over competitors. Hill was among a group who protested that action; they started to bolt a number of times, but ten troopers held them back until about ten minutes before the noon starting time. Then the line broke, with Hill near the lead, the soldiers fired, and a shot instantly killed him. The stampede continued without pause, triggering a break at other points as soon as the riders were seen. Participants also stampeded at most other points in the first and second districts. Subsequent events were equally chaotic and undoubtedly produced further killings, and threats of violence affected virtually everyone. Some claimants avoided violence only to face legal challenges over disputed claims. Even when the run proceeded according to schedule, countless individuals were injured in the frantic races following the starting guns or when mobs fought to board the trains or individuals jumped from the trains as they neared town sites. Still, the majority of participants did not secure a claim. The demand was far greater than the available land. Moreover, sooners secured some of the best locations, especially in the eastern third of the Outlet and at many townsites, particularly Perry. The chaotic process of settlement continued to affect the region's development long after the land run. Towns were over-built; farmers went broke on land unsuitable for farming. Other similar problems assured that many claims were abandoned by the end of the year. There were, of course, success stories just as there had been instances of neighborly actions, generosity, even gallantry during the run. Yet even those who managed to secure good land soon learned that farmers' opportunities were limited. The new towns, dependent on the farmers' business, faltered in a changing American economy in which the growth of industrialization had redefined the meaning of opportunity. Berlin B. Chapman, "Cherokee Allotments in the Outlet," The Chronicles of Oklahoma 59 (Winter 1981–82). H. Craig Miner, "Cherokee Sovereignty in the Gilded Age: The Outlet Question," The Chronicles of Oklahoma 71 (Summer 1993). Alvin O. Turner, "Order and Disorder: The Opening of the Cherokee Outlet," The Chronicles of Oklahoma 71 (Summer 1993). J. S. Wade, "Uncle Sam's Horse Race: Opening of the Cherokee Strip," The Chronicles of Oklahoma 35 (Summer 1957). Alvin O. Turner, "Cherokee Outlet Opening," The Encyclopedia of Oklahoma History and Culture, https://www.okhistory.org/publications/enc/entry.php?entry=CH021.